Then we will talk about the bottom of the place value chart and how it is in the story. I made cards from my 1-100 cards I made for TpT and added some more cards with just the hundreds place. I'll try and update the cards on those sites ASAP. We are going to have two students each pick a card from the hundreds card pile and one from the two digit card pile. We will find the number, write the numeral for the represented number and then say which one is greater or less than the other. We might also have a group of students do this and then have them line up in ascending order. I will be continuing to have the same linky each week. 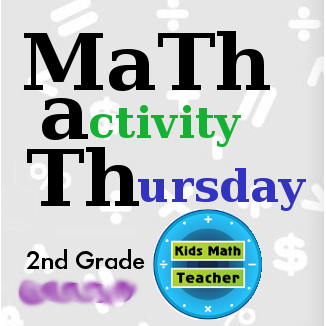 You can add as many 2nd grade math posts as you want. Have a great week! Just an update! It is official. I will be participating in the A to Z blogging Challenge again this year! So during the month of April I will be having a new blog post Monday through Saturday, each with a theme and the letter of the day : ) Wish me luck!